Here at SGS Engineering, we’re proud of our great range of Milwaukee reciprocating saw blades. We have a blade for every application, including ice hardened demolition blades, reciprocating blades, AX blades and a range of other Milwaukee Sawzall blades in metal. Simply click on your Milwaukee Sawzall blades of choice and you’ll be able to see all of its great features and technical specifications at a glance, so you can be certain you’re buying the right blade. Whether you’re looking to cut wood or metal, Milwaukee Sawzall blades are the ideal choice. They’re perfectly suited to a variety of applications and materials, from small jobs round the house to larger projects on industrial scales. Milwaukee reciprocating saw blades allow for faster cutting, as more material can be removed per stroke. This is because Milwaukee Sawzall blades have a unique tooth geometry, including a strengthened tooth tip design and a uniform gullet depth. 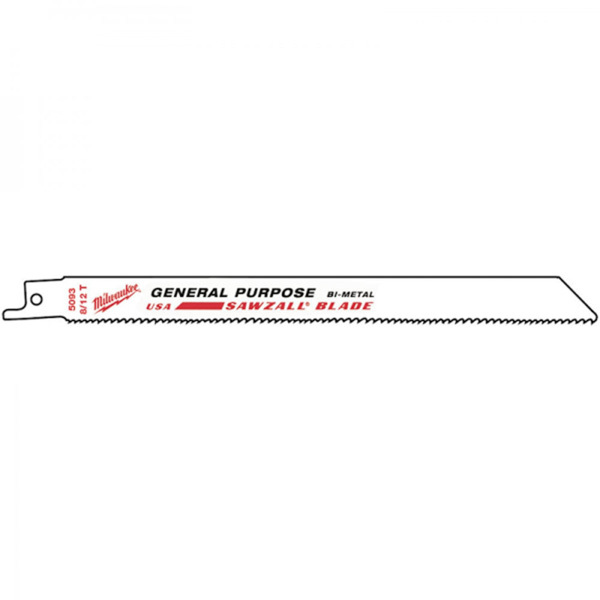 Browse the full range to find your perfect Sawzall blade, with prices starting at £4.83. Why Buy Milwaukee Reciprocating Saw Blades from SGS Engineering? At SGS Engineering, we’re proud to supply a superior quality product at an affordable price. As a UK-based company, we offer a 3-year warranty on all Milwaukee Sawzall blades, helping provide you with peace of mind. We also have a no quibble returns policy for 60 days and can provide you with free next day delivery option. Get in touch with us today on 01332 576 850 if you have any questions, or buy your Milwaukee Sawzall blades online with SGS Engineering today.